The stories that surround glass objects—about how these pieces are made, what they depict, and how they are used—have been central to the study of American glass since the publication of Edwin AtLee Barber’s pioneering book, American Glassware, Old and New, in 1900. Barber’s book explored the personalities who established early glasshouses in America and the imagery depicted on vessels, and in the nearly 120 years since, scholars have expanded Barber’s narrative to incorporate an increasingly diverse range of makers and forms. The body of scholarship on American glass now reaches beyond its early focus on luxurious housewares to consider the role of glass in politics, class and identity, technological innovation, and artistic practice. Stories in American Glass: New Scholarship, New Perspectives builds on earlier research to reassess overlooked object types, introduce new discoveries, and demonstrate the connections between glass and other media. 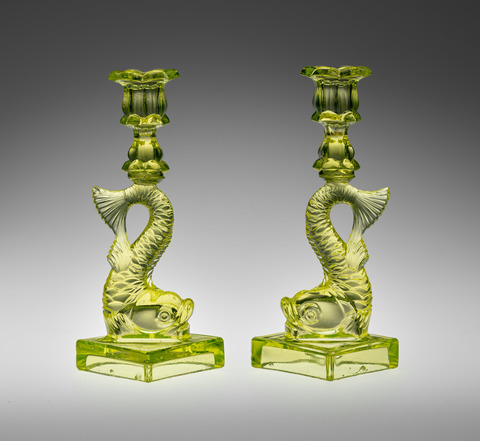 Exploring objects from the 18th century to the present day, this symposium reasserts the multifaceted role glass continues to play in American culture. The 2019 Oswaldo Rodriguez Roque Memorial Lecture and Symposium is being presented in conjunction with the exhibition A Nation Reflected: Stories in American Glass, on view at the Yale University Art Gallery from March 29 to September 29, 2019. What Is the Future for American Glass? Following the genesis of glass collecting in the 19th century, and in the wake of the heyday of classification and publishing in the mid-20th century, the field of American glass is prime for a 21st-century reboot. Kelly Conway, Curator of American glass at the Corning Museum of Glass, New York, introduces key foundational work established by collectors, dealers, scholars, and museums that has defined the field for over a century. Conway also envisions a framework for expanding beyond this traditional approach and reinventing the story of American glass. The memorial lecture and symposium are made possible by the Oswaldo Rodriguez Roque Memorial Lectureship Fund, established by a generous gift from the Chipstone Foundation and contributions by family, friends, and colleagues in memory of Oswaldo Rodriguez Roque, B.A. 1972, M.A. 1975, a scholar of American paintings and decorative arts.